Relax, meditate and float in this dream palace. In Udaipur, India, inserted into an idyllic setting with the Aravali mountains as backdrop and enveloped by the tranquil waters of Lake Pichola, the Taj Lake Palace emerges, a majestic palace of mosaics and white marble and a sumptuous dream hotel. Built on a small island in the mid 18th century the palace still retains to this day the inheritance and traditions of the rulers of the region. It is difficult not to marvel at the corridors, patios, lakes, gardens and fountains that welcome us with the memories, luxuries and extravagances of an era gone-by. Most of the rooms share the benefits of these surroundings with the interior lake or the mountains in the background, the palaces on the neighbouring island or the city in view. The comfort and period design, with rich fabrics, intricate wood carvings or colourful murals all create an unforgettable royal atmosphere. Give the exquisite Indian food selected from the region of Rajasthan a chance, or if you prefer less exotic flavours there is also a restaurant offering international cuisine. Select a special place in the hotel to dine and the Royal Butlers will do all to serve you princely wherever you wish. Your stay will be incomplete without surrendering to the care of the Royal SPA, offering several treatments based on centuries-old techniques of health and well-being, and without attempting yoga and meditation. When the time to leave arrives, you will continue to look back in order to once again admire this precious Indian jewel. 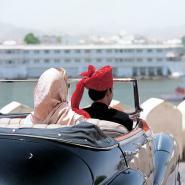 Taj Lake Palace is located on a small rocky island in the middle of Lake Pichola in Udaipur, in the Rajasthan region, about 26 Km from the airport.